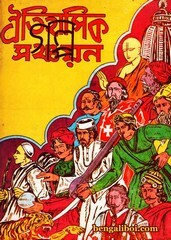 'Oitihasik Galpo-Sanchayan' the Historical events have been published in the form of stories. All this eighteen stories are written by the various well-known authors as Dr. Surendra Nath Sen, Dr. Dinesh Chandra Sen, Dr. Bimanbihari Majumdar, Dr. Jadunath Sarkar, Raybahadur Ashutosh Ghatak, Kalidas Roy, Jogendranath Gupta, Gojendra Kumar Mitra and many more authos. Edited by Gojendra Kumar Mitra and Sumath Nath Ghosh. The ebook pdf has 75 pages, 7mb pdf file size.